Contact us today. Bon appetite! 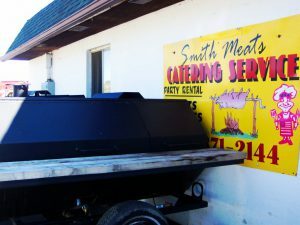 Smith Meats Catering Service and Party Rentals was started in 1984 as Smith Meats Inc. with RJ Smith and Paul Dowell. Soon after Joe Diem came on as partner and transformed Smith Meats Inc to Mid Michigan’s premier Catering Service and Party Rental Company! Family owned and operated Smith Meats offers good old fashion cooking with the best in customer service. 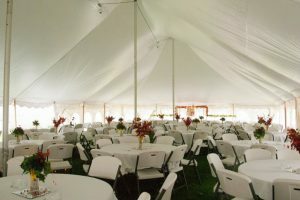 They have expanded from Hog Roasts and Meat Market to a full service party and catering company. No party is too big or too small, they do them all! Smith Meats provides a full menu, but will be happy to make your Grandma’s favorite recipe. 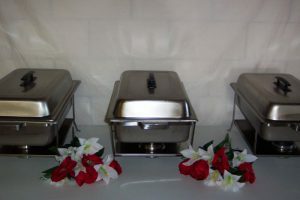 Order full catering service or pick up at your convenience for your next party. I planned a Surprise 60th Birthday Party for my Father and it was this last weekend. We ordered a complete dinner for 75, Chairs and Tables and picked it up. Dan, Victoria and Paul made the process easy, they helped with the menu, suggested what would work for 75 people and helped load my vehicle when I arrived to get the Tables, Chairs and Food. I had guests come up to me asking, “Where was this food from, it’s the best we’ve ever had.” I have used Smith Meats Inc in the past for our Diaper Party and it was good then too. Everyone’s favorite item on the menu was the party Potatoes. Thank you so much Smith Meats Inc. another superior job well done. I highly recomend them to anyone who needs help with their next party or event. Copyright Smith Meats. All Rights Reserved.